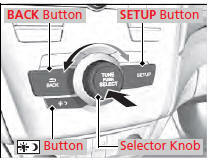 Selector knob: Rotate left or right to scroll through the available choices. Press to set your selection. 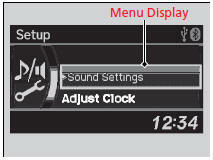 SETUP button: Press to select any mode such as the RDS Information, Sound Settings, Play Mode, Resume/Pause, or Adjust Clock. BACK button: Press to go back to the previous display. button: Press to change the audio/ information screen brightness. The brightness can be set differently for the day time and night time. Pressing the button switches the modes between daytime and night time. Adjust the brightness using . Press the MODE, , , or button on the steering wheel to change any audio setting.